Designed to eliminate the back-breaking labor of loading and unloading your crew's tools, the Vanair TR-500 Power Tool Rack easily handles up to three pneumatic tools, safely securing them during transport and, at the job site, lifting them safely from the truck to ground level. 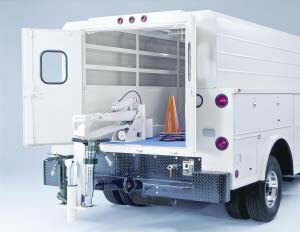 Driven by your truck's electrical systems, a 12-volt motor drives the TR-500's self-contained 2000 psi hydraulic system. Unit can be factory installed or field mounted.